A news and interview program, anchored by Erin Burnett. 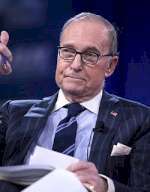 Rep. Joe Crowley (D-N.Y.); former HHS secretary Sylvia M. Burwell; National Economic Council director Larry Kudlow. Panelists include former White House adviser Karl Rove, former representative Donna Edwards, Michael Needham (Heritage Action for America) and political analyst Juan Williams.